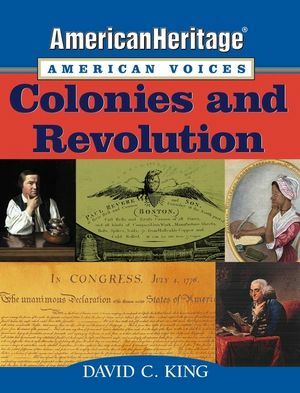 Find out what life was like in colonial America from the people who lived it! This first book in the American Heritage American Voices series will give you a rare glimpse into the day-to-day experiences of early Americans. You'll learn from fourteen-year-old George Washington about his Rules of Civility and Decent Behaviour (such as "Do not laugh too much or too loud in public. "); you'll read the testimony of an accused witch from the Salem witch trials; and you'll hear about the terrible conditions African slaves suffered when they were brought to America, from one of the slaves who survived. You'll also find out about what led up to the Boston Tea Party, what happened to the signers of the Declaration of Independence, and the daring mission of the first submarine (in 1776!). From Columbus's letter describing his first voyage to America to the Constitution of the United States, Colonies and Revolution presents a wealth of period documents, including diaries, letters, articles, advertisements, speeches, and more, from both famous figures and ordinary citizens. Find out how all of these American voices working together helped to make this country what it is today. AMERICAN HERITAGE is well-known for its magazine on American history, as well as its many highly acclaimed books, including The American Heritage History of the United States and The American Heritage Illustrated History of the Presidents. DAVID C. KING is a former history teacher and an award-winning author who has written more than thirty books for children and young adults, including Wiley's American Kids in History series.